Math is all around the young child from day one. How old are you? In one hour you will go to school. You were born on the 2nd. Number itself cannot be defined and understand of number grows from experience with real objects but eventually they become abstract ideas. It is one of the most abstract concepts that the human mind has encountered. No physical aspects of objects can ever suggest the idea of number. The ability to count, to compute, and to use numerical relationships are among the most significant among human achievements. The concept of number is not the contribution of a single individual but is the product of a gradual, social evolution. The number system which has been created over thousands of years is an abstract invention. It began with the realization of one and then more than one. It is marvelous to see the readiness of the child’s understanding of this same concept. Arithmetic deals with shape, space, numbers, and their relationships and attributes by the use of numbers and symbols. It is a study of the science of pattern and includes patterns of all kinds, such as numerical patterns, abstract patterns, patterns of shape and motion. 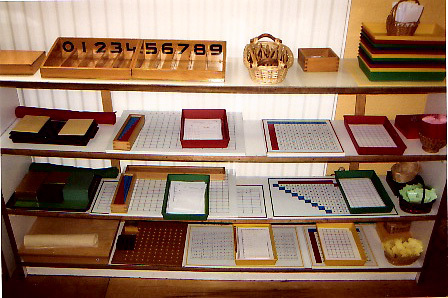 In the Montessori classroom, five families with math are presented to the child: arithmetic, geometry, statistics and calculus. More precisely, the concepts covered in the Primary class are numeration, the decimal system, computation, the arithmetic tables, whole numbers, fractions, and positive numbers. We offer arithmetic to the child in the final two years of the first place of developments from age four to age five and six. Arithmetic is the science of computing using positive real numbers. It is specifically the process of addition, subtraction, multiplication and division. The materials of the Primary Montessori classroom also present sensorial experiences in geometry and algebra. Little children are naturally attracted to the science of number. Mathematics, like language, is the product of the human intellect. It is therefore part of the nature of a human being. Mathematics arises form the human mind as it comes into contact with the world and as it contemplates the universe and the factors of time and space. It under girds the effort of the human to understand the world in which he lives. All humans exhibit this mathematical propensity, even little children. It can therefore be said that human kind has a mathematical mind. The infant and young child observes and experiences the world sensorial. From this experience the child abstracts concepts and qualities of the things in the environment. These concepts allow the child to create mental order. The child establishes a mental map, which supports adaptation to the environment and the changes which may occur in it. Clear, precise, abstract ideas are used for thought. The child’s growing knowledge of the environment makes it possible for him to have a sense of positioning in space. Numerocity is also related to special orientation. In the first plane of development, the human tendency to make order along with the sensitive period for order support the exactitude by which the child classifies experience of the world. 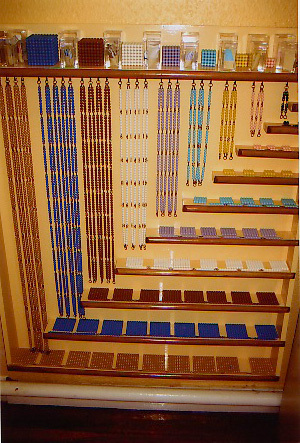 The Montessori materials help the child construct precise order. In the class, the child is offered material and experiences to help him build internal order. It is internal order that makes the child able to function well in the environment. Order under girds the power to reason, and adapt to change in the environment. Each culture has a pattern of function in that society. This pattern is absorbed by the child, and becomes the foundation of which the child builds his life. This cultural pattern is the context for the Montessori class. Practical life Exercises are the every day tasks of the home culture and include the courtesies by which people relate. The child is attracted to these activities because they are the ways of his people. He is attracted to the real purpose which engages his intellect. As he begins to work with Practical Life Exercises, he is more and more attracted to the order and precision that is required. Participation in these activities help the child become a member of the society of peers in the classroom. Without the child’s knowing it, these activities are laying out patterns in the nervous system. Repetition sets these patterns and leads to ease of effort. The Sensorial Material is mathematical material. It is exact. It is presented with exactness and will be used by the child with exactness. The activities call for precision so that the child can come into contact with the isolated concepts and through repetition, draw from the essence of each and have a clear abstraction. These concepts help the child to order his mind. He is able to classify experience. Clear perception and the ability to classify leads to precise conclusions. The Sensorial work is a preparation for the study of sequence and progression. It helps the child build up spatial representations of quantities and to form images of their magnitudes such as the Pink Tower. Spoken language is used to express abstract concepts and to communicate them to others. In addition to the spoken language, humans came to need a language to express quantitative experience, and from this came the language of mathematics. By age four, the child is ready for the language of mathematics. A series of preparations have been made. First the child has established internal order. Second, the child has developed precise movement. Third, the child has established the work habit. Fourth, the child is able to follow and complete a work cycle. Fifth, the child has the ability to concentrate. Sixth, the child has learned to follow a process. Seventh, the child has used symbols. All of this previous development has brought the child to a maturity of mind and a readiness of work. The concrete materials for arithmetic are materialized abstractions. They are developmentally appropriate ways for the child to explore arithmetic. The child gets sensorial impressions of the mathematical concepts and movement supports the learning experience. The material begins with concrete experiences but moves the child towards the abstract. There is also a progression of difficulty. In the presentation of the material, a pattern is followed. It is used throughout the arithmetic Exercises. For the presentation of the mathematical concepts, the child is first introduced to quantity in isolation, and is given the name for it. Next, symbol is introduced in isolation and it is also named. The child is then given the opportunity to associate the quantity and symbol. Sequence is given incidentally in all of the work. Various Exercises call for the child to establish sequence. The focus here is on the hierarchy of the decimal system and how the system functions. It also starts the child on the Exercises of simple computations, which are the operations of arithmetic. The third group will be started when the decimal system is well underway. From then on, these Exercises will be given parallel to the continuing of the decimal system. This third group, Counting beyond Ten, includes the teens, the tens, and linear and skip counting. The fourth group is the memorization of the arithmetic tables. This work can begin while the later work of the decimal system and the counting beyond ten Exercises are continued. The fifth group is the passage to abstraction. The Exercises in this group require the child to understand the process of each form of arithmetic and to know the tables of each operation. There is again an overlap. The child who knows the process and tables for addition can begin to do the addition for this group. He may still be working on learning the tables for the other operations and these will not be taken up until he has the readiness. The Exercises in the group for passing to abstraction, allows the child to drop the use of the material as he is ready. He can then begin to work more and more with the symbols on paper, without using the material to find the answers. The sixth group of materials, Fractions, can work parallel to the group of making abstractions and the early work with the fractions can begin even sooner than that. Sensorial work with the fraction material can be done parallel with the other groups of arithmetic. The writing of fractions and the operations of fractions can follow as the child is moving into the passage to abstraction. The adult is responsible for the environment and the child’s experiences in it. It is important to provide the indirect preparation of experience with numbers before it is studied. The arithmetic materials must be carefully presented as the child is ready. Montessori has emphasized that young children take great pleasure in the number work. It is therefore important that the adult not pass on any negative overtone onto the child’s experiences with arithmetic. These Exercises are presented with great enthusiasm. They must be carefully and clearly given to the child. In this work, it is also important for the directress to observe the child’s work. From observation, the directress will know if the child is understanding the concepts or if further help is needed. As always, the adult encourages repetition and provides for independent work, which will lead to mastery. When the child is ready, the absorption is as easy and natural as for other areas of knowledge. It is empowering and brings the child to a level of confidence and joy in another path of culture. The abstract nature of man is not an abstraction if the child’s development is understood by the adult.